The scarcity of the first edition has resulted in copies commanding huge prices, way beyond the reach of most Tolkien fans. In addition, subsequent changes to the text – particularly those to chapter 5, when Tolkien decided in 1947 to revise the text to bring it better into accord with events as they were developing in its ‘sequel’, The Lord of the Rings – mean that the opportunity to read the book in its original form and format has become quite difficult. 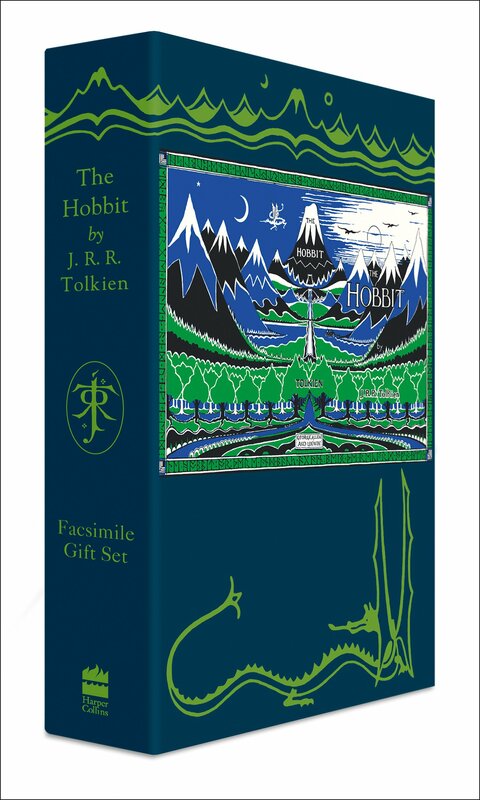 This special commemorative gift set includes the first edition, so that readers of all ages – not just ‘children between the ages of 5 and 9’, as Rayner Unwin famously declared in his report on the original submission – can finally enjoy Tolkien’s story as it originally appeared. It also includes an exclusive CD of archive recordings that capture Tolkien reading from The Hobbit, a special copy of Thror’s map which reveals the secret moon-runes when held to the light, and an accompanying booklet that relates the history of The Hobbit, and includes connected writings by JRR Tolkien. * and an accompanying booklet that relates the history of The Hobbit, and includes connected writings by JRR Tolkien. I'd love to see another attempt at the dustjacket, now we have a better high resolution source with fewer compression artifacts to go from. The last jacket was OK, given the way events played out, but it was always a bit compromised. At a minimum, this would be a great source for the flaps, even if the rest was too much hassle to re-restore. I'd do it myself, but not sure I have the energy to do it again (though I'm a sucker for punishment, so....). I guess the "CD of previously unreleased archive recordings featuring J.R.R. Tolkien reading from his book" (from the original description) was never really a thing. I have discussed the CD with HC, and what is on it. I originally assumed that it was the same material that has already been published, in particular on the Kindle enhanced Hobbit, and I believe that material will be on the audio CD. They also discussed that they had additional audio that had not so far been published, which I hope will be on this CD. It would really be awesome if they are finally able to release that new recorded material! Thanks Trotter, that's good to hear! That box is kind of a mess. The random slapping on of the dusjacket image looks really out-of-place and ill-fitting. Hopefully a little more thought will go into the real thing. Toning down the lurid green would be nice also, IMHO, as it was a bit over the top on the slipcase and the topstain. I'm most interested as to whether they will fix the colouring of the boards and whether the blank page will move to the correct place, tbh.